The latest issue of the Automotive News Europe monthly magazine goes live on Monday, June 5. 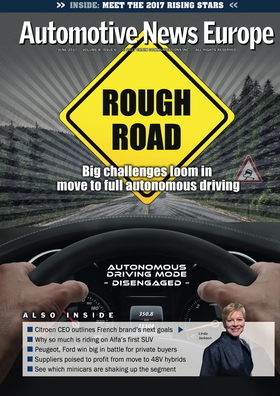 The new edition looks at the big challenges that automakers face on the road to fully autonomous driving. Fear of disruption from companies such as Google and Uber has prompted automakers to pour billions into developing self-driving cars. Now they are realizing that achieving the dream of fully autonomous driving will take much longer than their initial promises. Our cover story reviews the technological advances that are being made, looks at the legislative landscape and outlines which brands are the leaders and which are the followers in the race to launch vehicles that can safely drive themselves. In addition to saving lives, some automakers believe that their highly connected autonomous vehicles will offer another benefit: profits from the lucrative data that they hope to sell to tech companies such as Apple and Google. In our Final Word column, we explain why automakers will probably have as much luck selling data to tech companies as they would selling cabriolets in the North Pole. Nissan’s global marketing and sales head, Daniele Schillaci, is also responsible for the automaker’s pioneering electric vehicle program and battery business. In an interview he explained why he believes customer satisfaction with EVs will play a much bigger role than government incentives in making battery-powered cars a major factor in the future. Linda Jackson knows Citroen won’t reach her goal of having half of the French brand’s sales come from China next year. A big reason for that was Citroen’s late arrival to the hot SUV segment. Jackson explained what happened in China and why creating a new generation of sedans is not one of her top priorities. Alfa Romeo says its first SUV, the Stelvio, is set to become the company’s best-seller. The Stelvio is crucial to the struggling brand’s bid to return to profitability, especially after the slow sales start for the Giulia sedan. We assess Alfa’s revival strategy and review the Stelvio. Demand for diesels, which held steady in the immediate aftermath of VW’s scandal, is starting to crumble because of intensifying pressure on the powertrain, especially in France and Germany. We reveal which automakers are facing the biggest challenges from the diesel’s demise. Automakers are increasing technology levels and phasing out weak-selling three-door variants in Europe’s minicar segment to maintain consumer interest and cut costs. We examine how these changes will affect sales in the sector. As Carlos Tavares prepares to begin the grand experiment of integrating Opel/Vauxhall into PSA Group, he faces a vexing problem: How to avoid, or at least minimize, costly and disruptive plant closures and layoffs as he seeks to find billions of euros in savings and synergies. One area where Tavares may have some flexibility is in Europe’s light commercial vehicle sector. We explain why. We also review Opel’s flagship midsize model, the Insignia, which the German automaker has packed with advanced technology to lure buyers from premium rivals. The race to reduce emissions has a new entrant that is poised to play a major role: the 48-volt mild hybrid. Suppliers such as Continental, Schaeffler, Delphi, Valeo and BorgWarner are placing big bets on the technology, which has already attracted major players such as Renault and Volkswagen. Robert Bosch plans to leverage its dominant market position in combustion engine technology to become the leading supplier of zero-emissions solutions for electric vehicle manufacturers. We look at the steps the world’s largest supplier is taking to reach its lofty goal. The Peugeot, Ford and Renault brands were Europe’s first-quarter leaders in a key part of the retail business: sales to private customers. Starting this month, sales channel data from Europe’s five largest markets will appear quarterly in Automotive News Europe. We also introduce you to the 2017 Automotive News Europe Rising Stars. The award honors the best and brightest young leaders in the industry. Abbreviated profiles of the 2017 winners are inside the issue. To read the full interviews for all 16 winners, please visit anerisingstars.com.